Chad Reed (#22) again showed his skill for riding in difficult conditions with a top-ten finish. 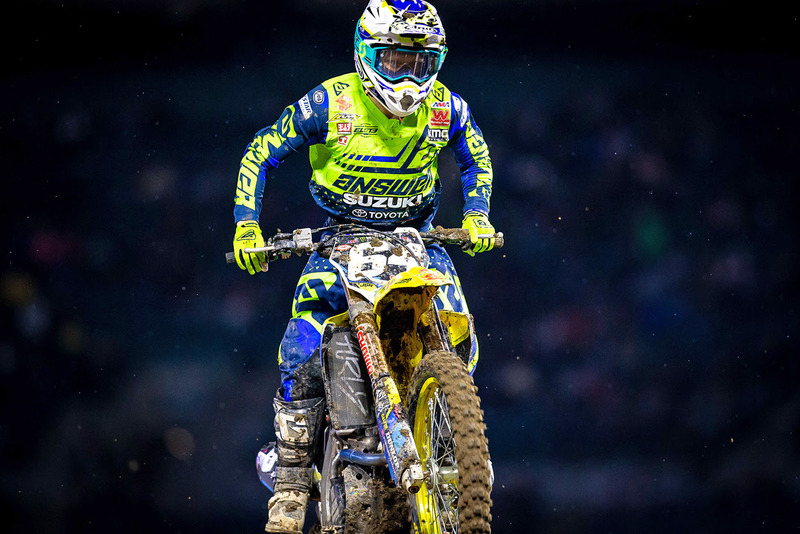 Brea, CA (January 7, 2019) – The JGRMX/Yoshimura/Suzuki Factory Racing Team kicked off the 2019 Monster Energy Supercross series at Angel Stadium in Anaheim, California on Saturday night. Despite difficult conditions resulting from a rare, wet winter storm, the team soldiered on to top-ten finishes. Fan favorite Chad Reed established more competitive records by earning his 205th career top-ten finish while competing in a record-setting 18th consecutive Supercross opener. RM-Z450 teammate Justin Hill fought hard to finish 15th. In the 250 West series, Jimmy Decotis secured seventh on the all-new 2019 Suzuki RM-Z250. Rookie teammate Enzo Lopes qualified third in his heat race and finished 15th in his first Anaheim main event. After racing the 250 East Supercross series in 2018, Jimmy Decotis was eager to contest the 250 Western Regional series. The Peabody, Massachusetts native instantly looked comfortable on the technical Anaheim Supercross track in qualifying third fastest. Decotis nearly holeshot his heat race, but went wide and tucked the front end. The 27-year-old used his veteran experience to meticulously work up to the front and transfer to the main event. After starting 10th, Decotis used his #64 RM-Z250 to move up to seventh by conclusion of the race. 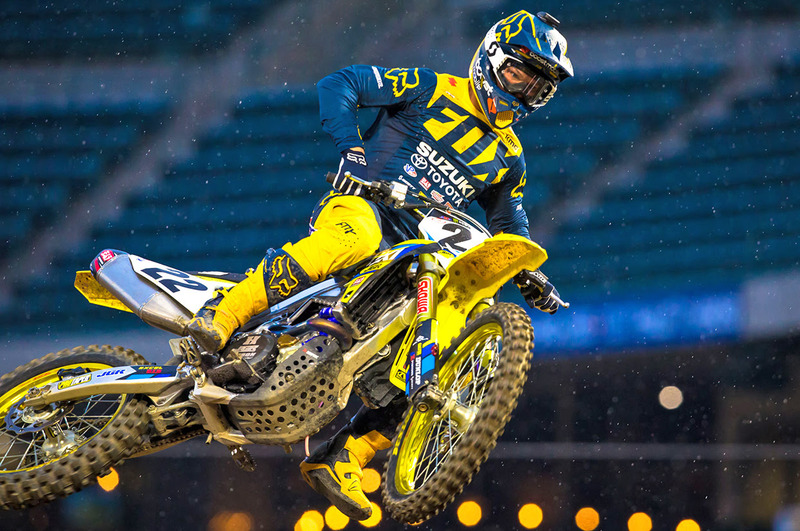 Jimmy Decotis (#64) debuted Suzuki’s new 2019 RM-Z250 with a top-ten finish at the Supercross season opener. Easily one of the most popular riders in the pits, two-time 450 Supercross Champion Chad Reed made the main event through the Last Chance Qualifier and put his name in the record books with his 18th consecutive Anaheim One Supercross race. As the heavens opened up, creating a muddy main event, "Reedy" embraced the challenging conditions in scoring ninth. It was his 205th top-ten finish in professional racing. Slick conditions kept Justin Hill (#46) out of the top-ten on his RM-Z450 at his first 450 class Anaheim Supercross season opener. Anaheim One served as Justin Hill's first time racing the opener in the 450 Class. The 23-year-old impressed in the daytime qualifying sessions, putting his Suzuki RM-Z450 on the top of the fast lap board. Slick conditions during the night program held Hill to 15th in the main event. 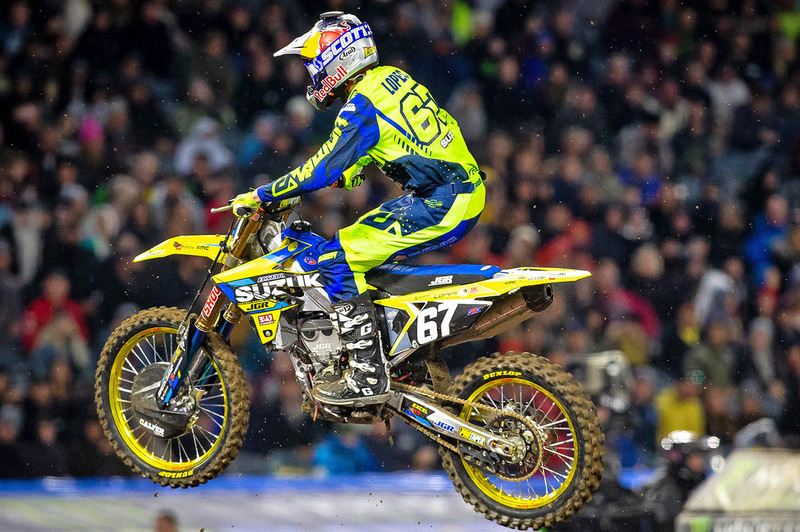 Enzo Lopes (#67) used the new 2019 RM-Z250 to finish 15th in his Supercross debut. Brazilian Enzo Lopes was eager to race his first professional Supercross, and "The Kid" rose to the occasion. Lopes qualified 10th fastest in combined 250 sessions, and then logged one of the fastest laps in his heat race. Unfortunately, a first-turn pile-up in the 250 main event slowed his advance. 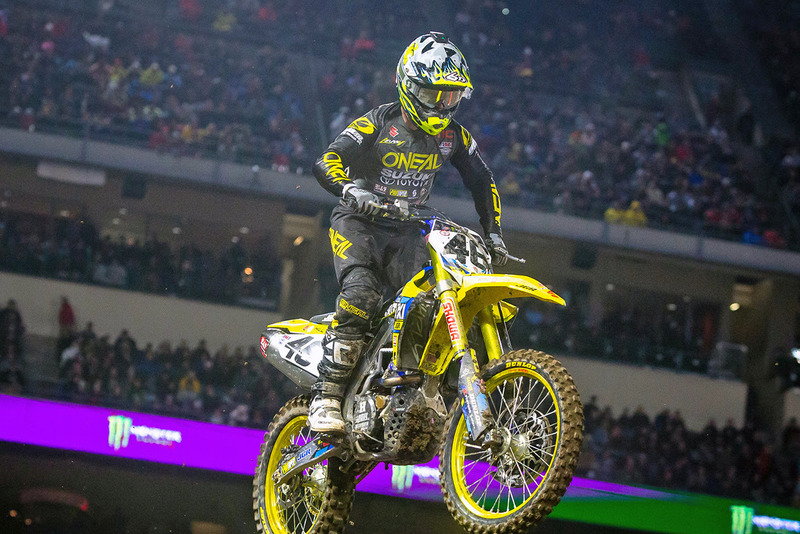 Still, Lopes rode exceptionally well in his first-ever Supercross. Jimmy Decotis [250 Class, 7th Place] – "The first round of the year with the JGRMX/Yoshimura/Suzuki Factory Racing crew was a blast. I was excited to debut the new Suzuki RM-Z250. I felt very comfortable all day. Unfortunately, I had a crash on the start of the heat race that put me in a tough spot for the main event. The conditions were tough due to the rain. Overall, I'll take a seventh given the circumstances. We have lots of racing to come, and I'm excited to grab some more starts. I want to show the industry what the new RM-Z250 can do. Thanks to the whole team for supplying me with the best equipment. I'm looking forward to Glendale!" Chad Reed [450 Class, 9th Place] – "With the weather, it was an interesting weekend. I had the feeling that no matter what I was going through, it was going to drastically change by the night program. I tried to get the most out of the daytime practices and qualifying to have good data for the next round in Glendale. Once the weather came I just dealt with it. I didn't get the best of starts in my heat race. The conditions were tough and challenging, so I had to go to the LCQ. In some ways, it rained quite a lot in the LCQ, so I had a feel for what the track was going to be like in the main event. The downside was that I was on the far outside gate for the main. I was dead last on the start and came up to ninth, which is respectable. I feel like I have the pace. There are just a few things I need to work on to allow me to feel more comfortable when I'm out of my comfort zone. I have to adapt to the pace, but fortunately that's one of my strengths. Sometimes that pace comes naturally, and other times it's forced. I need to be more comfortable in that area. That's something I will work on this week." Justin Hill [450 Class, 15th Place] – "For a moment in time, before I fell in the slop, that was the best I had ever felt in a mud race. I'm very bummed about the end result, but there are several good things that I learned from this weekend that I can apply to the next 16 rounds." Enzo Lopes [250 Class, 15th Place] – "Practice and the heat race was awesome. I don't know what happened in the main event. Somehow I stalled my bike, and then I crashed, so that made it worse. It was unreal to line up on the gate for my first Supercross race. I had that dream as a kid. I had a perspective of watching from the stands or from home. Placing third in the heat race was incredible. I had the speed, but the track was sloppy, so I couldn't attack. The main event wasn't what I wanted, but there's another race. I learned a lot." Jeremy Albrecht [Team Manager] – "Jimmy Decotis rode great. He was the best one of our group. He didn't get a great start in the main event, or things would have been different. Once Jimmy cleared traffic after the opening laps, he started putting together great times. Enzo Lopes rode awesome all day. He qualified well into the main event, but stalled the engine off the start. Enzo was charging through the pack, but was taken wide in a corner and fell. What's interesting is that Weston Peick watched Enzo closely all day and was very impressed with him. That was cool to hear. Lopes did well for his first ever Supercross race." "In the 450 Class, Justin Hill had a tough day. He has been riding really well, but for some reason he struggled with the Anaheim track. Justin can ride better than his results show from Anaheim, and he will be looking to redeem himself this weekend. Chad Reed struggled all day, but a ninth place in the main was acceptable. He's not happy with finishing ninth, so that's good. Our team is healthy, the Suzuki motorcycles were great, and the riders aren't happy with their results. That tells me there are better things to come." The JGRMX/Yoshimura/Suzuki Factory Racing Team will travel to the University of Phoenix Stadium in Glendale, Arizona on Saturday, January 12th, for the second round of the 2019 Monster Energy AMA Supercross Championship. This will also serve as the second of the 250 Western Regional Supercross rounds.